Certified laptop security safe by Yale Safes. Awarded a Silver in the Sold Secure Accreditation scheme. 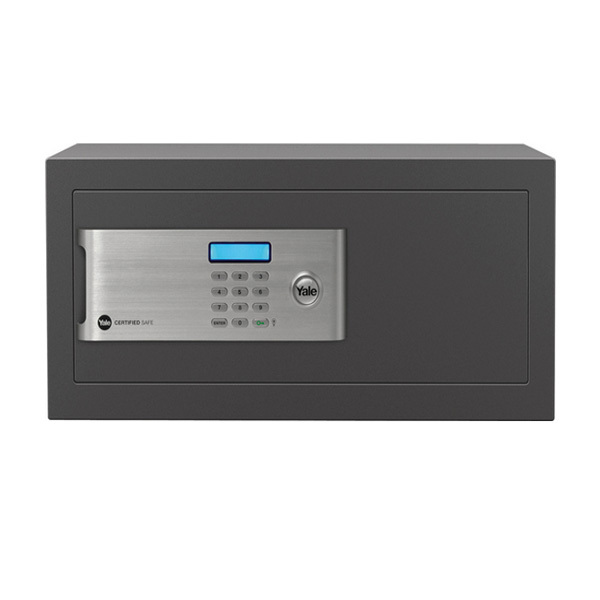 Electronic combination lock with blue LCD powered by 4 x AA batteries (included). 6 lever double bitted back up key lock in case of lock out (supplied with 2 keys). Solid steel 22mm motorised locking bolts for extra security. Motorised locking bolts open the door automatically. Door opening 136 x 392mm (HxW). Extra bright internal LED lighting when safe door is opened. Fully felt lined interior to protect valuable items. Finished in dark grey with attractive brushed metal handle.